The 2018 season for the Philadelphia Union, which at times looked to be painfully mediocre, was all-in-all quite exciting to watch. Bořek Dočkal tallied a league high in assists, breaking Cristian Maidana’s club record with 18 in his first and only season with the team. Cory Burke was a revelation for the half of the season, seemingly scoring every time he touched the pitch. Jim Curtin led his Union side to a playoff birth in convincing fashion, knocking off Minnesota United 5-1 at home. His team also charged its way to yet another U.S. Open Cup final, only to be ousted by an underwhelming Houston Dynamo squad. 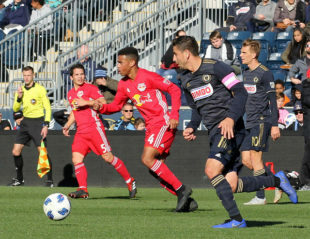 Questions about the inexperience of Curtin’s trio of central defenders remained prevalent throughout the season, but each flashed moments of potential, giving Union supporters something to be hopeful for. It was an exciting year. Despite the glimpses of this team’s potential, it still finished right where it always does: trophyless and right in the middle of the MLS Eastern Conference table. So what concerns were left for new Sporting Director Ernst Tanner and his staff to address in the offseason? Check. Or is it Czech? With the loan of the Czech international coming to an end at the conclusion of 2018, the club was tasked with finding a suitable replacement for not only their best player last season, but their number 10–arguably one of the most important positions in the modern game. There were some candidates already on the roster, but it was imperative that they go out and sign someone–someone big. Alejandro Bedoya, once signed with the intention of occupying the central midfield role, was no longer an option to fill that vacancy. The team captain and USMNT member has happily adjusted to his new role, playing out wider and deeper in the midfield. Academy players Brenden Aaronson and Anthony Fontana have the making to one day slide into the starting 11, but they’re no where near the the type of class that Dočkal possessed. Who is? In order to replace a talent like Dočkal, management would have to dig deep into its pockets to come up with a signing of that nature, something it has been reluctant to do in the past. The former Chivas and Eintracht Frankfurt star and current staple in El Tri’s rotation was the choice to replace. Fabian, 29, is poised in possession, has the ability to pick out the final pass in the attacking third, and has the willingness to lead a team. He is a more than viable option to replace someone like Dočkal, but the signing is just that–a like for like replacement. The only thing he brings to the table that Dočkal did not is some increased marketability given his near icon status for many in North America. It would be hard to think that in May of 2018, with the team struggling to pick up results and score goals, even Jim Curtin himself believe that he would still be employed by the Union at the start of the 2019 season. With him comes a track record of mediocrity after just two playoff appearances in five seasons and three losses in cup finals. To put it simply: if Curtin coached in the English Premier League, he would have been sacked long ago. Cup final appearances are nice, and while the journey to those finals may be thrilling, it is about end results. One thing has become increasingly clear over the course of the offseason and it is that the Union are still committed to the Villanova alum who is now set to enter his fifth full season in charge. Management rewarded Curtin with a contract extension and despite all of the shortcomings in 2018, he did lead the team to its best ever finish with 50 points on the season. A triumph good enough to finish fourth in MLS Coach of the Year voting. Much like how Jim Curtin still being in charge leads us to believe that management has full faith in him, the fact that the Union did not make a great effort to sign another forward should lead us to believe the same about Cory Burke. Burke finished the season as the team’s joint highest goal scorer with 10 goals, despite breaking into the team in May and not getting into the starting 11 until after that. He is a raw, unrefined talent with speed for days and an eye for goal, but is he at the level to produce year after year like a Bradley Wright-Phillips or even a Sebastian Le Toux? The team trading away longtime forward C.J. Sapong to Chicago, who, in his own right has proved from time to time that he can score goals at a prolific rate, proves that there is a strong belief in Burke to produce in 2019. In my eyes, the signing of 24 year old Brazilian striker Sergio Santos is not a real threat to Burke’s role in the team. Tanner quite likes the forward who bagged himself nine goals in Chile’s top flight last season, but I view him as more of a prospect for the future with potential to get into the squad should Burke’s performance dip this season. Burke did not impress the way fans may have hoped during the team’s preseason games in Clearwater, but he did his job and continued his goal scoring form, which is what is required from a top striker. If there is one thing for sure about the Union roster, it is that Andre Blake is the guy in net. He is time and time again the most consistent player on the roster: you always know what you can expect of him. The Union midfield has very quietly one of the best in the league. A strong holding midfielder, a box-to-box workhorse, and a number 10 with success at the highest level. The greatest question comes from the defense and its inexperience. In 2018, Auston Trusty went from never playing a single minute in MLS to becoming the youngest player in league history to play every minute of his team’s games over a season– mostly out of necessity, but a very impressive feat nonetheless. Jack Elliott began the season as the Union’s most experienced central defender, but at 23 years old it was not saying much. After a poor run of games for the Englishman in April and May, he lost out on his job to homegrown player Mark McKenzie. The teenager seized his opportunity and turned heads in his first season as a pro, and alongside fellow homegrown player Auston Trusty the two formed a serviceable pairing in the back. It was not until the final stretch of games when their inexperience was truly exposed after a couple of own goals and general dysfunction against NYCFC in the playoffs. The signing of former MLS Defender of the Year Aurélien Collin adds some experience and veteran leadership to the backline. Collin will be a help, but the only true way to gain experience for the young players is to play and learn to compete and the Union are doing just that by sticking with them. ..I sit at my desk with an entirely different sensation as 2019 season begins with Ernst Tanner. I’ve been fortunate enough to speak directly with him as it relates to the kids, and have noticed the jettisoning of first team players who personally I was not too high on for varied reasons in CJ and Keegan and to be honest, Andre- who I think may be next to go. All this to say. Ernst does not seem to be approaching this from a POV of trial by fire and careful esteem building and ‘results do not matter’ because there is no relegation- as Alejandro once opined similarly to Ricky Waters. Wether that also falls in line with my personal need for aesthetic, remains to be seen, because if it’s not rhythmic and beautiful, you might as well be playing oblong football. In my opinion the biggest concern for Union are the flagging spirits of a disinterested fanbase. Here’s hoping Ernst Tanner is building and has built a culture and quality that can reinvigorate the hardcores who are a bit dismayed and the casuals MLS so dearly and desperately need to convert a percentage of —-to hardcores…..to be relevant in a crowded market. I find so many things wrong with this article, I don’t even know where to start. So I’ll just say that I think Ernst has made major strides to make this team MLS relevant, for maybe the first time in team history. That alone gives me hope for the future. I think all the main points are spot on – we still don’t have a forward better than Burke, Fabian needs to prove he’s better than Dockal, and our back line is a year older but still super young. I do think that Tanner is miles ahead of where Stewart ever was here as far as first team goes. Our roster is too far off for what we need for this system (i.e. our overload of wingers) and will take a couple windows to balance out, but I think Tanner is aiming to make this a fun team to watch and I’m optimistic. He still needs a coach that will get him there though. At 24 Santos isn’t “..a prospect for the future with potential to get into the sqaud…”. He was brought here to start. “The fact that the Union did not make a great effort to sign another forward…” Huh? Bedoya wasn’t brought here to be the #10, he got shoved into the role to fill a hole. Fabiian is not “…a like for like replacement.” His scoring ability is beyond Dockal though he isn’t as much the distributor. I could go on if you need me to. Tanner may have done more with his first offseason, than Stewart did with all of his. While results will prove if his moves are correct, you can see sound reasoning behind every action. From the roster, to the budget, to tactics there is a clear vision being presented. The vision is also clear to Curtin who will either produce results with the roster he has (creating whatever formation works best to get those results) or move on to his next assignment. I worry about Trusty. He hasn’t shown that he’s a prime defender- bad at keeping the ball at his feet , risky when distributing the ball and makes bad decisions under pressure. At this point he should be a sub. The last preseason against D.C., he made a lot of mistakes. He always does! Fully committed by giving him a one year deal?